The Central University of Karnataka (CUK) was established by an Act of the Parliament (No. 3 of 2009) at Kadaganchi, a village of the Aland taluk of Gulbarga district, Karnataka. It is one of the 16 new Central Universities established by the Government of India during the UGC XI Plan Period to address to the concerns of ‘equity and access’ and to increase the access to quality higher education to people in less educationally developed districts which have a Graduate Enrollment Ratio of less than the national average of 11%. 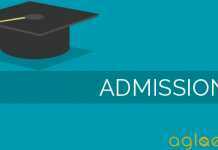 Central University of Karnataka Admission 2019 details is given below. The Central University of Karnataka Admission to all programs mentioned below will be through Central University Common Entrance Test (CUCET) 2019. All the Students are required to register themselves online on the University website after declaration of results of CUCET-2019 to appear for the Counselling. The students whose name figures in the merit list as displayed on the University website and Notice-Boards are required to present themselves with all relevant documents in original at the time of Counselling. Candidates who are willing to apply for the CUCET 2019 will apply online through their official website www.cuk.ac.in. Candidates must keep a valid email ID, Scanned photograph & signature, online payment options handy before applying. The exact dates of the event of Central University of Karnataka Admission 2019 is provided below. Candidates should check the eligibility criteria, application procedure, and all other information before applying. Candidates who have applied for Integrated B.Tech-M.Tech programme are hereby informed to note that, the Central University of Karnataka is offering following standalone programmes in Engineering for the year 2019-20. For further details, kindly read the prospectus for CUCET 2019 given below. The University admits eligible candidates to various Under Graduate, Integrated, Post Graduate Degree, M.Phil. and Ph.D. programmes mainly through CUCET 2019. The admissions will be offered on the basis of the order of merit in the entrance examination and as per the reservation rules. The candidates whose qualifying examination results are not declared at the time of admission will be given provisional admission and their admissions automatically stand cancelled if they fail to secure the required percentage of marks in their qualifying examination or fail in the said examination. The candidates so selected will have to give an undertaking in the format given in the prospectus to this effect. 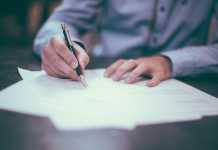 The candidates admitted to any of the programmes and whose results are still awaited at the time of admission need to submit the marks card of the qualifying examination to the Department concerned within 30 days from the date of admission. 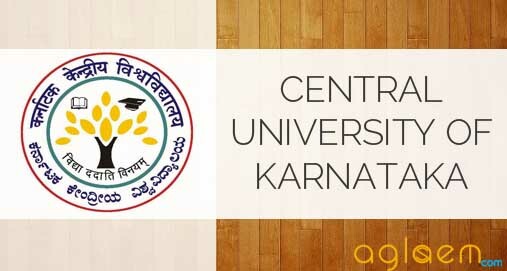 Click here to check complete eligibility criteia of Central University of Karnataka Admission 2019. The Central University of Karnataka will release the Provisional Merit List for UG & PG Programs. Candidates can check it from the official website i.e. www.cuk.ac.in. or through the link that will be provided below after the examination is over and when the results will be declared. 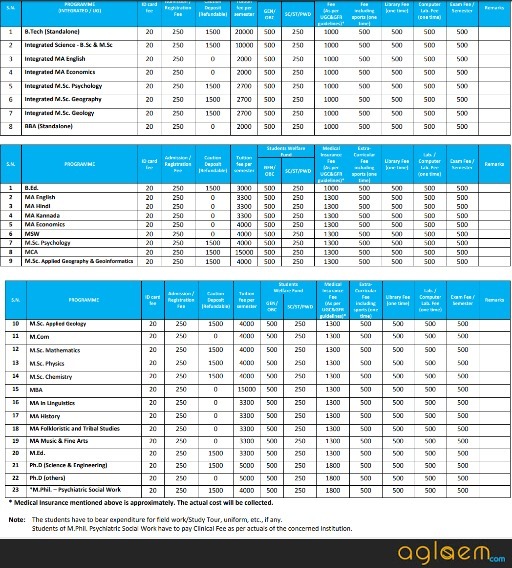 The complete fee structure for various courses offered by the Central University of Karnataka is given below. Check them before the course(s) you are applying for. Insofar, Only eligibility criteria of CUCET 2019 has been announced yet. Rest of Information on this page as per last year details. As soon as the conducting body will release the official notification the same will be updated here.